Today I'll look at how you can make you social media content interesting and creative. Sometimes, it can be difficult to know what to post and how to convey a message in an engaging way. But there are ways of doing it; it just takes time and patience- two things we all tend to lack! 1)	Create mini images- you can make these anywhere like Microsoft word, Publisher or if you’re feeling even more creative, you could something more fancy. But basically, it’s just a mini graphic you use to help convey a message. You may have seen them around, but I create them to help advertise our training courses, have a look at the example below, made on Word! 3)	Create a short film- it can just be filmed on your mobile phone or tablet. Something that shows what you do as an organisation and what impact your work as on people. I would probably suggest that instead of making one long film; create multiple short videos that show different things. So, for example you could have a short 2 minute video interviewing to a volunteer or service user about their experiences and how your services have helped. Or you could video a tour of your offices! You could film absolutely anything, and the great thing about short videos is that people are more likely to watch multiple 2 minute videos than one long one. It’s also great because you don’t have to create them all in one go, you can spread them out and post them on all your social media channels every so often. 4)	Create infographics- these are images which show information. It is a very visual and colourful way of showing data and facts. Canva is a great free tool to use https://www.canva.com/ . You can even make your little graphics I mentioned earlier, on Canva. I hope this helps you in someway. I'll be back in a couple weeks with some more tips on how to make the most out of your social media accounts! 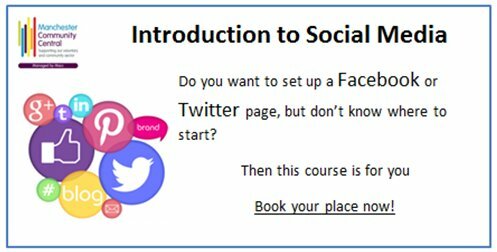 Remember to keep an eye on our training page here https://www.manchestercommunitycentral.org/news-and-events for our next Social Media or Marketing training course.